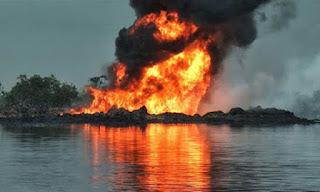 Suspected militants in a twin attack, Monday morning, bombed two oil installations belonging to an oil exploration company, near Batan community in Delta State. Details of the incident were sketchy at the time of this report, but locals said the explosions occurred at about 12.05 am on Monday. The double strike came as Niger Delta Avengers, NDA, debunked the claim by the Minister of Youths and Sports, Mr Solomon Dalung, that he met with the militant group at Oporoza, saying he was apparently defrauded by Niger Delta fraudsters. Meanwhile, the Niger Delta Suicides, NDS, another militant group in the region, has warned that it would devastate the economy in different forms if government refused to create a genuine platform for talks with militants. A security officer attached to 3 Battalion, Effurun, near Warri, who also spoke to Vanguard, said a team of military personnel has been drafted in company of a surveillance team to ascertain the extent of damage. “This fight is a fight by everyone, including children yet unborn. Thank God, we have successfully planted Adaka Borohs and Tompolos everywhere. So, we are waiting,” he said.